The second annual Run for Good 5K attracted an estimated 1,500 runners April 17 and the NorthBay contingent was by far the largest. 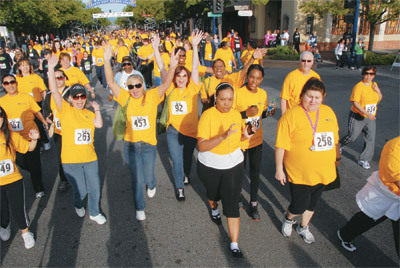 Like a river of gold flowing down Texas Street, nearly 400 NorthBay Healthcare employees and their families, ran or walked in the downtown Fairfield race. Clad in gold T-shirts, they helped the event raise an estimated $30,000 for the Matt Garcia Youth Center. The 3.1-mile course was created to be used by elite runners but accessible to people of all abilities. 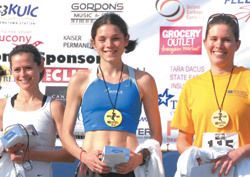 Two professional runners took first and second place; Crosby Freeman won with a time of 14 minutes, 48 seconds. He was followed by Keith Haskins, who finished second in 15 minutes, 5 seconds. First to cross the finish line from NorthBay was former high school and college runner Chris Dalton, a tech support analyst from the IT Department. He finished at the 18-minute mark, well under a 6-minute-mile pace, but not as fast as he had hoped. Ken McCollum, vice president of Human Resources, finished second in his age group, just missing a 10-minute-mile pace. Katie Lydon, an OB clinical nurse, finished first in her age group and 15th overall in the women’s division. After the competitive runners came the parents running with kids, people pushing strollers, and those running with dogs. By mid-morning, the final walkers completed the course. As last year, NorthBay Healthcare was the event’s presenting sponsor. 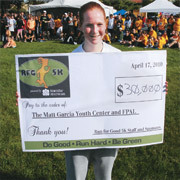 Armijo High School student Katherine Boatwright displays the amount of money raised for the Matt Garcia Youth Center. The Matt Garcia Youth Center welcomes boys and girls from 7th to 12th grade. Located in the old 24-Hour Fitness Center, it is also home to the Fairfield Police Activities League. Three adults are present at all times, including volunteers and off-duty police officers. The center is named after the late Fairfield City Councilman Matt Garcia, who tragically lost his life in a drive-by shooting in 2008. Garcia had championed the project to give local teens a safe after school outlet. For more information about the center, call (707) 422-6288 or visit the Web site, www.fairfield-pal.org. The center is also on Facebook.